In retaliation for losing the North Carolina governor’s race, Republicans are quickly moving to strip all power from the executive branch. Democratic candidate Roy Cooper won a hard fought gubernatorial campaign against cry-baby Pat McCrory, who refused to concede defeat and challenged the election results in every possible way. So now Republicans are responding by trying to turn the governorship into a powerless position in one of the most baldfaced power grabs this nation has ever witnessed. Republicans are literally using the floods and hurricane damage as cover to convene a special session of the legislature to pass bills designed to give themselves more power while taking power away from the governor’s office simply because the new governor will be a Democrat. One bill would merge the ethics and elections boards into one body and would change the overall makeup of the combined board so that Republicans control the whole thing. 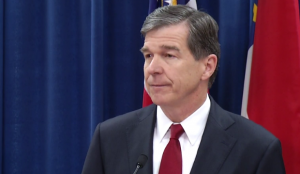 Current law gives Democrats the majority because Cooper is going to be governor. Another bill would eliminate 80 percent of the governor’s staff, from 1,500 employees to only 300, which would make Cooper’s job excruciatingly difficult. Furthermore, Republicans are trying to pass a bill requiring state Senate approval for Cooper’s cabinet picks, which means the state of North Carolina will likely be denied leadership in various state agencies because Republicans will more than likely refuse to approve of anyone Cooper picks. Republicans are literally trying to cripple Cooper’s administration before he even takes office. But that’s not all. Republicans also introduced a bill that would prevent the state Supreme Court from reviewing cases for years by requiring cases to go through the state Court of Appeals first. Democrats gained the majority on the Supreme Court in November while Republicans have the majority on the Appeals Court. So, it’s pretty clear what Republicans are doing. Republicans are also trying to take cabinet positions away by turning them into independent agencies whose leaders would be appointed by the lieutenant governor, who happens to be a Republican. In short, North Carolina Republicans are screwing over the people and the state because they can’t handle losing an election. They are pathetic losers who should be forced out of office before they do any more damage. North Carolina pastor William Barber is reporting that Republicans have introduced 15 bills in all targeting the power of the governor and he is organizing protests against the GOP power grab. The people of North Carolina should be outraged by what Republicans are doing. They voted for Roy Cooper as their governor but Republicans are trying to sabotage him to prevent him from doing the job the voters elected him to do. Republicans are acting like petulant children because they lost the governor’s race. If Democrats did this, they would be throwing a temper tantrum. ← Don’t Ride that Frog, Mouse!